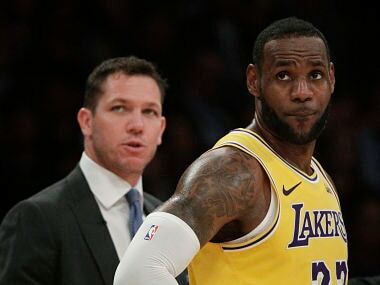 Los Angeles: LeBron James has defended Luke Walton's record amid ongoing speculation concerning the Los Angeles Lakers coach's future with the franchise. 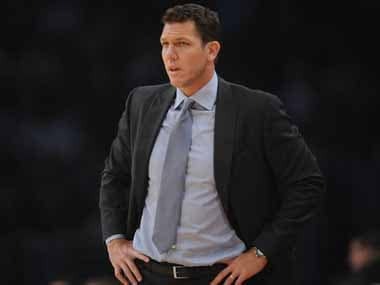 Walton is widely expected to be shown the door by the Lakers at the end of the season after a disappointing campaign which saw them fail to make the playoffs for a sixth straight year. However, James said injuries and suspensions throughout the campaign left Walton short of resources for key parts of the season. James cited the suspensions handed down to Rajon Rondo and Brandon Ingram in the first game of the season as well as a litany of injuries as reasons for the team's problems. "No one expects for a suspension to happen on opening night," James told Spectrum Sportsnet television in an interview. "No one expects for injuries to happen the way they did with our franchise this year. Where your starting point guard is out for numerous games. Your starting small forward is out. "I'm not talking two or three games here, everyone is back in the lineup. We're talking like 15, 20, 25 games." The Lakers injury toll also included James, who missed 17 games between the end of December and February after suffering a groin strain. The NBA superstar's absence – the longest injury layoff of his career – triggered a slump which saw the team fall out of playoff contention in the Western Conference. James said that when all of the Lakers' key personnel was fit, the team had been a match for most other sides in the league. "We had a defensive rating of fourth in the NBA, and we were like seventh in offense when we played together over 23 games," James said. "As good as that is, it's not enough for Luke to even know what he has on a consistent basis, when you don't have a consistent roster every night during the season. "Like you said, control what you can control and you've got to play the hand you're dealt. I think he played the hand as well as he could."